FAQs- How can I tell my pet is sick? FAQs- How can I help my arthritic Dog? FAQs- How can I help my vet to diagnose my pet's illness? FAQs- Why might my dog show aggressive responses at the veterinary office? Coronavirus disease is an intestinal infection of dogs that is usually short-lived, but may cause considerable abdominal discomfort for a few days. The cause is a virus of the Coronavirus family. The virus gets its name from the fact that when viewed from above under an electron microscope, the virus has a ring of projections which appear like a coronet or small crown made of ornaments fixed on a metal ring. Different coronaviruses cause infections in many species of animals and birds. Canine Coronavirus do not affect people. Infected dogs usually shed the virus in their feces and saliva for one to two weeks, sometimes longer. 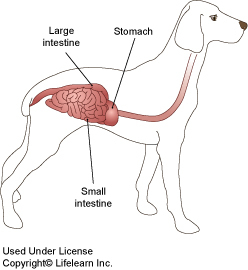 A susceptible dog becomes infected by eating from contaminated food bowls or by direct contact with an infected dog. "Crowding and unsanitary conditions favor transmission." Crowding and unsanitary conditions favor transmission. The incubation period from ingestion to clinical signs is one to five days. What are the signs of coronavirus? Most infections are sub-clinical and produce few clinical signs. Occasionally an infection may cause more severe symptoms, particularly in young pups. The most typical symptom is diarrhea, typically sudden in onset, which may be accompanied by lethargy and decreased appetite. The stool is loose, with a fetid odor and orange tint. It may contain blood or mucus. If a pup has a mixed infection, for instance both coronavirus andparvovirus (see the Client Education Handout "Canine Parvovirus"), the illness will be more severe. Are there diseases that can be confused with coronavirus? There are many causes of diarrhea in dogs. Severe cases of coronavirus can be easily confused with parvovirus, and they may occur at the same time. Be sure to see your veterinarian if your dog has diarrhea that does not resolve within twenty-four hours or is associated with significant lethargy or loss of appetite. There is no specific treatment for coronavirus. "Antibiotics are ineffective against viruses, but may be useful in controlling secondary bacterial infections." Antibiotics are ineffective against viruses, but may be useful in controlling secondary bacterial infections. Withholding food for twenty-four hours after diarrhea ceases and gradually reintroducing small amounts of food may be the only required treatment. A dehydrated patient may require intravenous fluids to correct the problem. Early medical intervention is the key to successful treatment of severe cases. Canine coronavirus vaccines are available. This vaccine is not recommended for all dogs and will be administered based on your dog's lifestyle and risk assessment.